Join other people who attend Chenrezig centre's different meditation classes to experience a wonderful day of delights at the beautiful Manjushri Centre, near Ulverston. We had a similar visit last year which was enjoyed by many people from Chenrezig Centre. 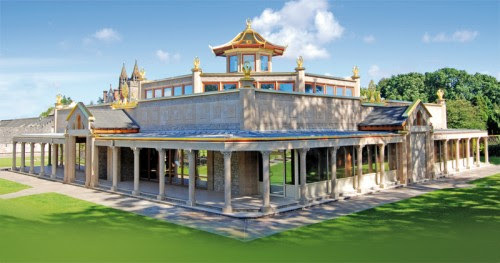 It will include teachings from Kelsang Dema, a look round the incredible Temple for World Peace (picture above), the surrounding woodland and beach, lunch and time in the cafe, gift shop and book store. Put the date in your diary - more details coming nearer the time. Meditation courses in Lancaster & Chenrezig Centre Day Course at Manjushri .